Fly along with Elecopter as she soars above the savannah, patrolling the skies with her fire-hose nose at the ready. The other animals are safe with Elecopter on the scene—Elecopter is a hero for all! Preschoolers are in for a treat in this chant-along companion to Monkey Truck. 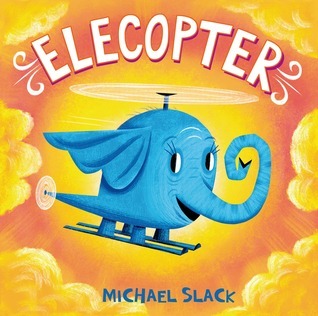 Michael Slack’s picture book, Elecopter, reminds me of one of the Little Golden Books I had as a kid, but with a modern twist. Instead of a little engine that could, there’s a helicopter that’s inexplicably also a wide-eyed, blue elephant. Elecopter’s expression changes from one of delight, to panic, to determination, as she rescues animals from the flames of a wildfire, and then extinguishes the fire with her fire hose nose. My first thought, as an adult reading this book, was “What on earth is an elecopter?” but kids will surely love the nonsense of it all. Plus, Slack’s colorful, intricate paintings and rhyming prose add to the book’s readability. It’s sure to be a favorite read-aloud book for kids who love memorizing books as their parents read aloud, thanks to its rhyme scheme.